Looking for professional, dependable, affordable and friendly limousine services in Fremont, CA and the surrounding cities in the great San Francisco Bay Area? Call : 510-742-8898,Or Book a Limo Online...!! Website : www.aurevoirlimousine.com Limo Services Are Satisfactions Guaranteed...!! '' Life Is A Trip...Enjoy It...!! '' TCP # 10710. Efraim brings experience and dedication. From the Private to the Industrial environment he offers all the services needed to restore order and cleanliness. 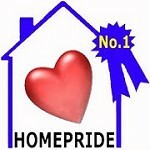 With such a wide range of services you must have confidence in choosing HomePride with their strong community commitment. That's great to have good service that is always in demand! Homepride is the real deal!